Scott Perry Hasn't Met James Dolan Yet, Which Is Maybe A Good Thing? “I have not met with him yet, but I’m looking forward to that,” Perry said of Dolan. Hmm! It seems ... odd that the new general manager of the New York Knicks has not yet met the owner of the team, like that’s the kind of thing that normally ought to happen maybe during the hiring process? Or maybe soon after, maybe a handshake and congratulations. Nothing? Nothing? I’m going to be honest, here: I’m not sure how to feel about this. On the one hand, filling a position as important as general manager without the new hire so much as meeting the team owner seems like a lolKnicks kind of thing. On the other hand, maybe you don’t want your new GM meeting James Dolan ever! Maybe this is a signal of the seriousness of Dolan’s commitment to stay clear of basketball decision-making? 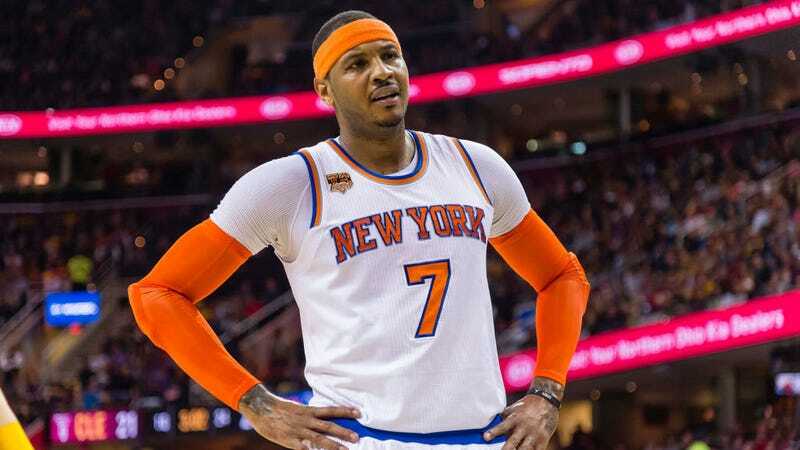 What face is Carmelo Anthony making about this news? Is it this one? Because they are the Knicks, it is probably best to err on the side of pessimism, so that your heart will not be destroyed too badly when the team’s basketball operations inevitably spiral into some new horror shape of dysfunction. Scott Perry seems like a nice, thoughtful, spirited man, with a good, expressive face—it will be sad watching him turn into a gravelly, dead-eyed drone over the next 18 months.